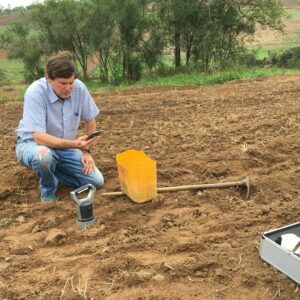 Earlier this month we had the opportunity to talk with Christy van Beek, Chief Agronomist at AgroCares and Director of the SoilCares Foundation, about the importance of using soil-scanning technology in emerging market countries like Uganda. Uganda, like most countries in sub-Saharan Africa, is facing an escalating soil fertility crisis and without immediate interventions, the country will continue to lose nutrients and thereby threaten its resource base. To halt and revert the trend of continuous depletion of the farmers’ most precious resource, the current practice of farming needs to be revisited. Increasing productivity while decreasing soil fertility decline demands balanced fertilization. At present, farmers are refrained from on-site information and base their fertilizer selection on intuition or on tacit knowledge and advice from local agro-dealers, without knowing the actual nutrient status of their soils. This results in a mismatch between applied nutrients and required nutrients for productive soils. 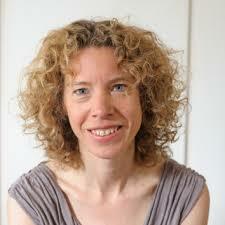 More so, applying non-limiting nutrients result in economic losses and environmental degradation. 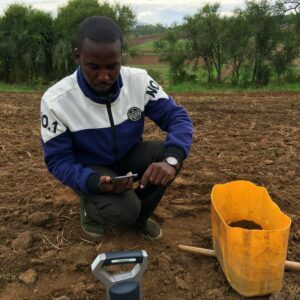 This problem can be overcome when farmers are able to base their fertilizer selection on real-time information of the nutrient status of their soils. However, in Uganda, as in many parts of the world, farmers hardly have access to reliable and specific soil information. Conventional soil test laboratories can’t give real-time information; soil samples need to be taken, sent to the laboratory and be analyzed there–a slow, expensive method, with results that are often difficult to interpret by farmers. World Food Bank has recently become a strategic partner with AgroCares and has already begun utilizing the NIR technology on our Mbarara farm in Uganda. Chief Agronomist George Sunga (left) and President Scott Brown (right) use the NIR technology on World Food Bank’s Mbarara farm in Uganda.